I have a friend who’s a professor in the Cal State system. He’s spent years, of course, researching in his field of study. I’ve heard him expound at length on educational theories and approaches. It’s kind of sad, because it’s really all so simple. Such great advice. Perhaps I could give advice on lounge singing to Dolores. “Don’t sing off key. 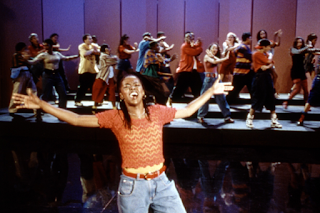 Sing pretty.” Just, you know, do what you’re doing but do it really, like, well. 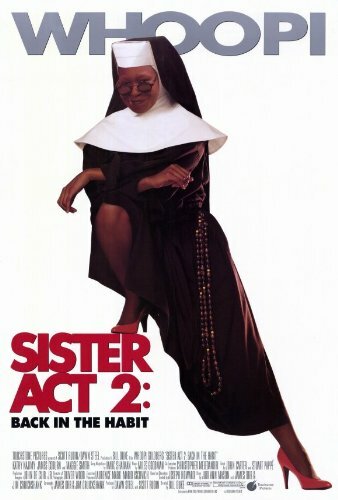 Sister Act 2 is a sequel to Sister Act. 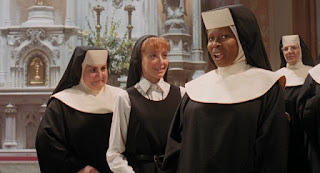 In the first film, Deloris is on the run from the mob, and to hide she impersonates a nun and lives in a convent. In this film, the same group of nuns have begun teaching in a parochial high school in downtown San Francisco. 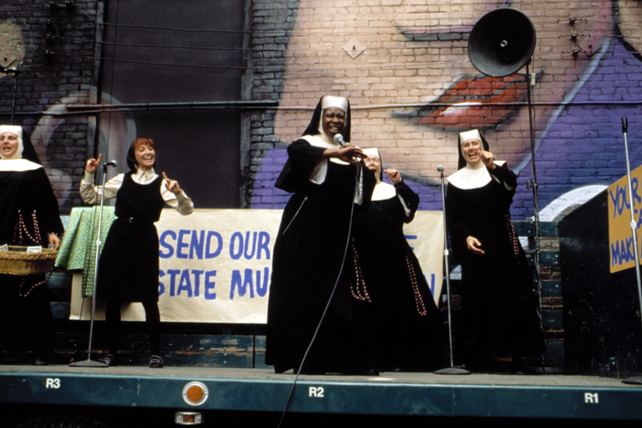 The sisters want Deloris to teach music, but Father Maurice (Barnard Hughes), who runs the school would not, they believe, accept a lounge singer without qualifications to teach. So Deloris pretends to be a nun so the setup of the first film can be repeated. Did you ever have one of those late night conversations about integrity and lies? One person says it is never right to lie, and someone else says, “Well, what if it’s WWII, and you’re hiding Jews in your house, and Nazis knock on your door and ask if there are Jews in the house? It’d be okay to lie then.” Sister Act (the original) has killers after Deloris, so you can understand why the sisters would bend the truth. If someone argued, “I think it’s okay to lie if it’s to get a job you’re not qualified for,” the argument wouldn’t stand up to late night conversation, let alone in ethics class. But these nuns are more than okay with lying so that Deloris can teach as a pretend nun at St. Francis Academy. Once they get to the school, the nuns tell Deloris, “The Fathers at St. Francis are strict. If they found out you’re not a teacher or a nun, you’d be out.” Deloris again takes on the name of Sister Mary and meets the priests who teach in and run the school. Father Ignatius teaches math, Father Thomas teaches Latin, and Father Wolfgang is the cook. None of them seem very good at their jobs; the Biblical concept of giftedness doesn’t seem to come into play. In education there are numerous ideas about the practice of discipline (as in the Christian life), but the headmaster gives no specifics about what he’s talking about.Since we saw no knuckles rapped with rulers, it must be somethng other than that. Mary comes into her music class to find kids rapping spontaneously, but for some reason no one notices any musical giftedness. 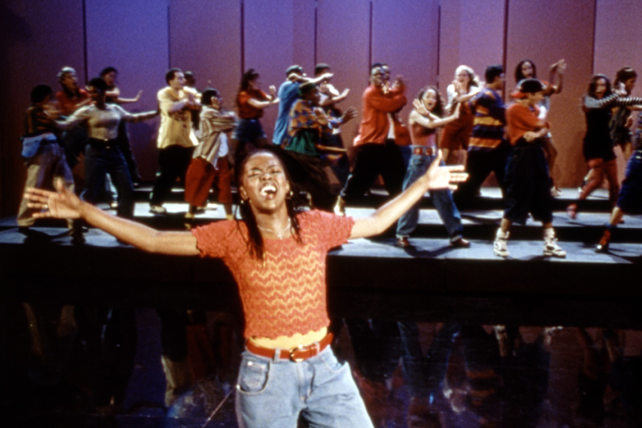 (That high school kid, Rita [Lauryn Hill] might make something of herself musically speaking.) Mother Superior tells her, “Well congratulations, you’re the new mayor of Sodom and Gomorrah.” But the class seems pretty clean cut to me. Eventually Sister Mary makes the radical choice to make her music class into a choir. This takes everyone by surprise for some reason. The class does a wonderful performance of “O Happy Day” (a song I love). She also encourages the other teachers to not be boring -- because so many teachers go to class, planning on being boring. If only someone had told them not to be. But trouble is brewing. The school is in financial trouble. Mr. Crisp (James Coburn), the financial director for the Diocese, wants to close it down. The nuns and priests are sad because, “It’s the only school in the area, and if it closes kids will have to be bused somewhere else.” Which is a little crazy, because there a quite a number of high schools in the city of San Francisco (a quick Google found seven Catholic high schools) and the public transit system is good. Will they win the competition? Does something else happen? Do they save the school? I don’t want to spoil the film for you by answering those daunting questions. But I will give a Movie Churches rating to the parochial school and the clergy in the film. They don’t need to know much about education, and they don’t seem to have very high standards of truthfulness. They do seem to care about the kids, and Mary/Deloris gets the kids to perform a spontaneous, unrehearsed, and yet awesome performance of “Joyful, Joyful, We Adore Thee,” so for that the school and clergy get Two Steeples.